Cupcakes 'n Daisies: Last Blast of Summer . . . .
A quilting friend of mine, who doesn't have a blog, shared these pictures of this amazing summer quilt with me. I've been intending to share it with you all summer long. Since today is the last day of August, I thought I better get to it. This quilt was made by Gloria for her granddaughter. The pattern was designed by Carol Burniston and was in the May/June 2008 issue of Fons & Porters Love of Quilting magazine. The pattern name is Summer Flip-Flops. I fell in love with this quilt way back then and saved the pattern. I think Gloria did an amazing job with the whole project but I really like her selection of flip-flop fabric. I would like to have a pair of each one of them in my closet. 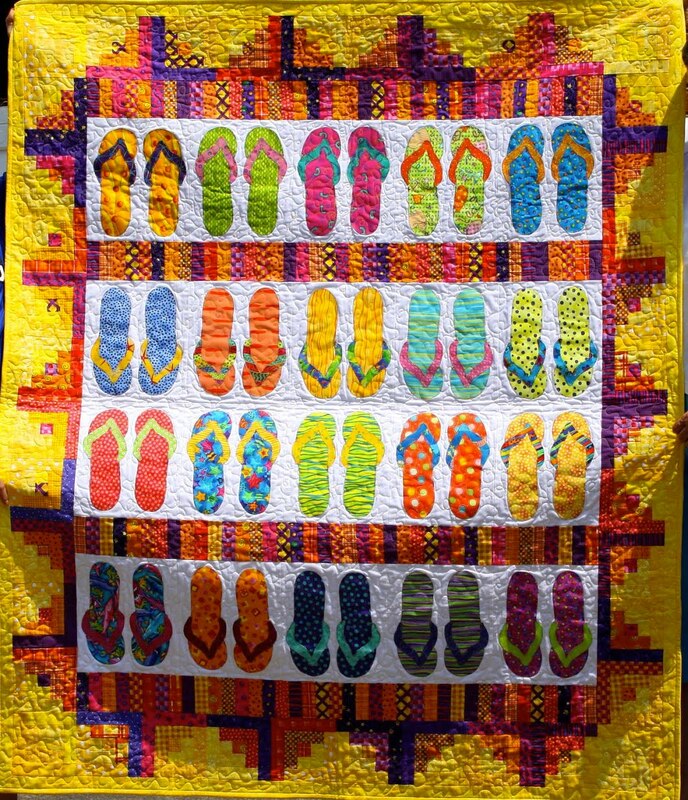 It won't be long until I'll be putting my summer flip-flops up for the winter, but if you had a quilt like this, you could leave your flip-flops out all the time! Gloria and I both have a love for red and white quilts. As a matter of fact, Gloria's very first quilt was a red and white sampler quilt. She puts red fabric in almost every quilt she makes and is always looking for red fabric in any quilt shop she visits. She took her first quilt class over 20 years ago. I've been cleaning out my pattern binder and this pattern is looking for a new home, if you would like to have the pattern for this quilt leave a comment asking to be included in the drawing I'll have over the weekend. If you don't want the pattern but love that flip-flop quilt as much as I do, please leave a comment for Gloria. I get comments and emails from quilters who don't have blogs all the time, I'm so happy to showcase one of them on my blog, I hope you'll make Gloria feel as good about her quilt as you always make me feel about mine! be in the drawing, I just wanted to let Gloria know she did an awesome job. Pretty. I love to look at flip flops, but I just can't wear them, lol. The quilt is so summery, just love it. Don't add me to the drawing. I just wouldn't get it made. 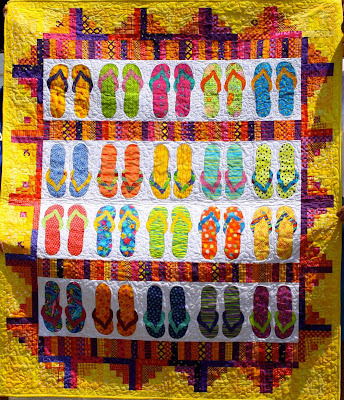 That is an adorable quilt and I love flip flops! Since you both like reds...I recently found a new free block of the month that is a red and white quilt called Peaceful Pathways by Esther Aliu. You still have time to get the first month's instructions. She takes them down when she posts the next month. The link is in my left sidebar. I hope to make it one of these days! What says summer better than flip flops? What a wonderful quilt! Love the colours you chose...Well done Gloria! Count me in for the draw please. Love the color combinations - I'm a red fan myself. Thanks for sharing. Gloria knocked this one out of the park! Love it in all it's colorful glory!!!! I know I'll never make that quilt, but I do want Gloria to know that I absolutely love it! Great choice of fabrics and colors! I saw that pattern too! I love the quilt. So bright and cheery. It's a very cute quilt! It makes you smile. I'm not a flip-flop girl, but I do like the quilt! Gloria did a wonderful job on the flip flop quilt! Love all the colors! I am a flip flop girl for sure. Please tell Gloria that she did a great job and the quilt is beautiful. I love all the colors in it. I like the quilt, but don't think that I'll make one, so don't include me in the drawing. Thanks for sharing. I have saved this pattern also. I have a darling, granddaughter that has the same flip flop fetish that I do! The plan is to make us matching quilts! Seeing Gloria's wonderful version makes me want to start them right away! Beautiful job, Gloria!!! What a fun quilt! Gloria's colors are a taste of summer - just loved the bright and cheery colors. I live in northern Alberta where the winters are bitter, but our summers are beautiful, sunny and hot and I wear flip flops every day. I would love to have the pattern. I LOVE your flip flop quilt. It is WAAAAAY cool!!! are you too young to remember when flip flops were called "thongs"?!? or "zorries"?!? p.s. - although it is an awesome quilt, i don't need the pattern - but thank you, anyway! Gloria, that is such a super cute quilt! My little sister is the flip-flop queen and would die if I made this for her! Thanks for the giveaway! I would lve this pattern. Gloria's quilt is really nice, I like how she did the border. If you haven't taken a look already, go to Anne Sutton's blog at Bunny Hill (address posted above). On August 25, she posted about your beautiful red and white quilt!! Anne is a great designer of quilt patterns. 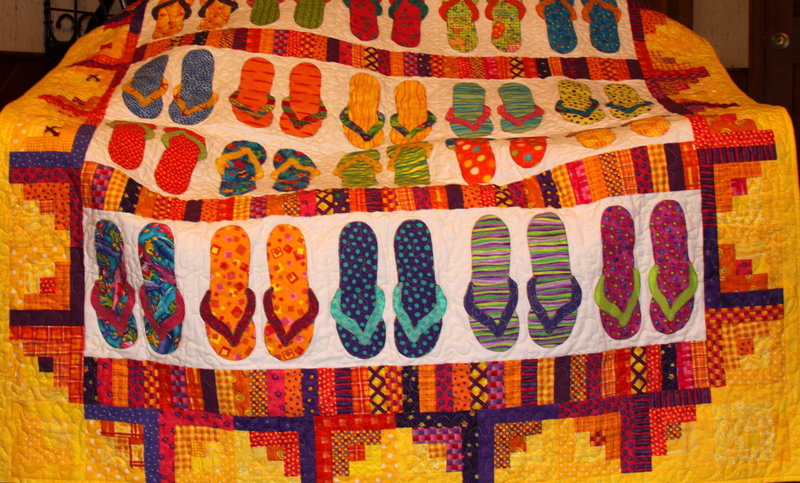 I enjoyed the picture of the flip flop quilt! Your friend did a great job with the colors. I'd love to be in the drawing for the pattern. It's just too cute! No need to be in the drawing for the pattern. I have collected enough to last me two lifetimes. Just wanted to say how CUTE that quilt is. Gloria did a wonderful job on it. Lucky grand daugther she has! Great job Gloria! The fabric choices are perfect for this quilt and I LOVE LOVE LOVE the pattern. Please include me in the drawing and thank you for the opportunity. Have a great 'last half of the week' Thelma! I would love to have the pattern to try one of those! Just happened on your blog tonight while blog surfing and LOVE it! Hope you don't mind another follower. :) Gloria, your quilt is absolutely amazing!! Just love all of the summertime bright sunny colors! Tell Gloria I love her flip flop quilt, much better than the one from the pattern. She did a great job!